Lightly salted and tossed in olive oil, these toasted hemp seeds are great for snacking or adding to other dishes. Great on Oatmeal, Cereal, Yogurt, Salads, Soups, Stir Fry and more! Adds a great crunch and texture to your favorite meals! 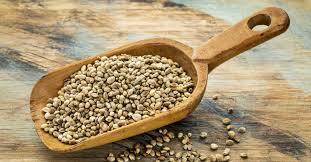 Hemp seeds are packed with good stuff, a complete plant protein with a balance of omega 3 and omega 6 fatty acids. Hemp is a super food that you need to incorporate into your diet today!